You will notice that our fixed cogs are unique when compared against traditional fixed gear cogs. There is an industry-wide problem with all threaded fixed gear cogs – they have a tendency to strip threads. To avoid this problem we designed the fixed gear cogs with a spline interface. The spline interface mates to our single speed hubs on both track and ENO hubs – a simple, positive solution. 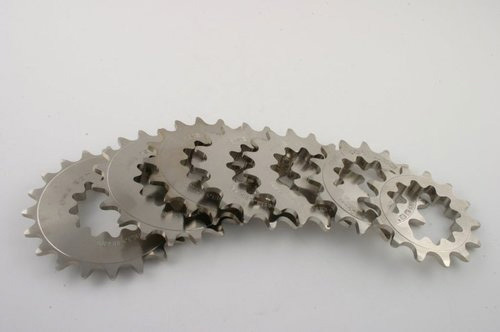 The cogs are made out of 8620 case hardened steel and have an electroless nickel finish. Available in sizes 13t – 20t in both 3/32″ and 1/8″ widths. The cog is designed to be used with a standard English 1.29 x 24 tpi threaded lock ring.